Upcoming Events — Dressing Toronto's Beautiful Brides since 1988. The perfect combination of glamour with that incredibly sensuous fit, the stunning new 2016 collection by Spanish designer Rosa Clara has everyone talking. The incredible detail in the beadwork together with the dreamy tulle and lace, create gowns that are unique, dramatic and truly unforgettable. Join us Halloween weekend for treats and promotional pricing on these beauties! Spaces are Limited. RSVP below or call us at 416.466.8884 to book your spot! Here's a little sneak at what to expect at our Preview of the New Spring 2016 Collection by Anais Anette! The sisters have busily been preparing their new collection for October market and lucky us, we get to preview their new designs before anyone else! Established in Toronto in 2013, sisters Magdalena and Karolina have a design ingenuity in their DNA that has been refined by four generations of dress-makers and seamstresses. The Anais Anette brand preserves the construction mastery of the sisters’ heritage, elevating it with a clean, contemporary design aesthetic. Join us Friday September 25th & Saturday, September 26th, 2015. Spaces are Limited. RSVP here or call us at 416.466.8884 to book your spot! Join us on February 27 & 28, 2015 to view and try on the new "Mystic Love" Collection by Canadian designer Anais Anette. This season's collection is an ode to an ethereal boho aesthetic that is full of Chantilly lace and flowing silhouettes. We just love this locally made collection for their stellar workmanship and unique design that make their gowns truly flattering yet easy to wear. If you would like to join us please click the "book trunk show" button below. Join us on Saturday, February 14, 2015 for our Shop Accessory Event! Come on in and view lovely new hair adornments , veils, belts, jewelery, shoes by designers Karolina Keeler, Blair Nadeau Millinery, BenjaminAdams and more! Check out our Facebook page or our Instagram for more designer profiles and sneak peeks at what's to come! If you haven't picked those perfect finishing touches yet, come on out and get expert advice or customization service from some of the designers themselves who will be here to help style our brides. Please RSVP below to save your spot! Canadian designer Anais Anette have busily been preparing their New Collection for October market and lucky us, we get to Preview their New Spring 2015 before anyone else! Join us on Friday, September 26th to Sunday, September 28th, 2014 to be the first to try on all of their new gowns! Please "Book Your Spot!" below. Anais Anette Fall 2014 Pop UP Trunk Show! Featuring new gowns from the dynamic Canadian duo just after their Fall 2014 Lookbook shoot! 2 days only! Friday, Feb 28 & Saturday, March 1, 2014. By Appointment. Until the end of December, It's sample sale time at Vogue Sposa and this year we are taking 10 - 80% off select wedding gown and cocktail dress samples by Magdalena Gmyr, Anais Anette, June, Vogue Sposa, YolanCris, Tara LaTour, Dessy, Aftersix, Lela Rose and more! Wedding gowns start at $250 and Cocktail dresses start at $50. If you are still looking for a great deal on a wedding gown or need a cute little dress for your next holiday party, give us a ring! There's only one of each and most of them are a size 8 to 12 and the best ones tend to get snapped up quickly! We are also doing our Holiday Food Drive for the Daily Bread Foodbank so please bring a non-perishable food item and we will tack on an additional 5% off! To be the first to grab the best of the dresses give us a ring at 416.466.8884 or by clicking this link to our booking form. Just in time for the holidays, Vogue Sposa Bridal Boutique will be hosting a 3-day Accessory Trunk Show on November 29, 2013 to December 1, 2013. It's the great opportunity to find the perfect finishing touch to your bridal attire or to find a little something special for your wedding party. There will be jewellery, headpieces, veils, bridal cover-ups and more. Featuring new collections by Anais Anette, Nancy Ciccone, Karolina Keeler, Distefano and June Bells. To book please fill in the booking form below or call us at 416.466.8884. Please include you phone number to confirm appointment. 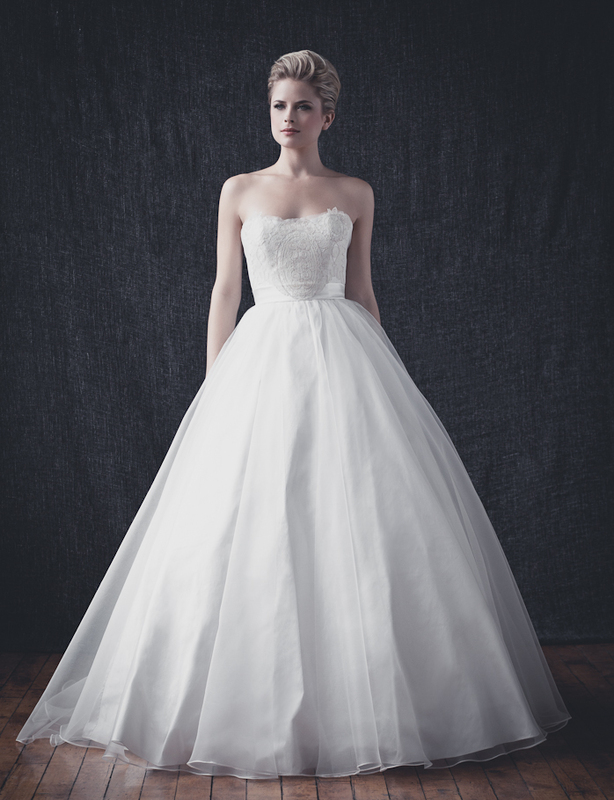 Anais Anette is known for their stellar workmanship and modern take on the classic bridal gown. Created by two sisters, the daughters of a dress maker and a tailor, the young women grew up surrounded by couture workmanship and a fine-tuned attention to detail. Their love of whimsical Parisian style and couture garment finishing became the foundation on which Anais Anette was built. Every gown is draped, beaded and crafted in the sisters' Toronto studio by the designers themselves and we love that they still have a hand in making sure that every gown they produce is finished to perfection. This season, you can expect to see a variety of lace treatments and illusion french net over structured bodices. Silk noil is introduced to provide organic texture to the season. The look is soft and understated and is perfect for the bride who has high style in mind and recognizes truly beautiful tailoring. Paired with their signature freshwater pearl and Swarovski crystal accessories the Anais Anette Collection is full of romance and femininity. The Anais Anette Collection should be on every future bride’s watch-list this Fall.